Nait and his sister Naitalie are traveling around the world meeting families affected by the disease that they are named after, Neonatal Alloimmune Thrombocytopenia. World travelling Nait Bear arrived, making his first Australian visit to the Bebbington family, of Corndale, Northern Rivers of New South Wales. Nait's internery included Knockrow castle, Protestors falls, Minyon falls, The Channon Markets, The Byron Bay Lighthouse, Croc Dundee's famous Beach Hotel, Lismore's Anzac memorial site, Shelly Beach and the Big Prawn in Ballina. Nait stopped in Bangalow for coffee, tried on Grandma’s slippers in Lennox Head, got licked by a wombat, met a hawk, a snake, a cockatoo, a kangaroo, even an emu. He had a train ride at Heritage Park and insisted on having a lismorian roundabout experience on the corner of Molesworth and Conway Streets. He visited Lismore's regional art gallery and admired the aboriginal paintings on the Ngulingah Local Aboriginal Land Council by the Bundjalung nation. He spent hours with the kids in our own front yard, checking out Thomas the rabbit, riding Toffee and Liz the goats, Baza our dog was definitely jealous of all the attention Nait was getting and puss wasn't interested at all. Nait had a great time in the fairy garden and spent hours swinging with the kids in the hammock. We even paid a visit to the nurses in Endoscopy at Lismore Base Hospital. Even though it's now time for Nait to leave, his journey continues to meet another family affected by NAIT in Croydon, Victoria. Not surprisingly his departure was delayed as apparently Nait conspired a plan and instructed my son Wilson to hide him under his drawers so he could stay longer, their plan worked but only for a day. 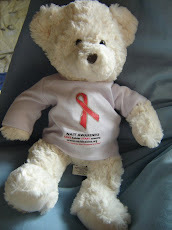 Nait bear has offered our family a little bit of sunshine to the association of the NAIT disorder. Hopefully raising awareness will mean no other parent will go through what we did. Our NAIT story began when Laura was a few days old, despite the bruising and petechiae it wasn't until I insisted the pediatrician correct a tounge tie which oozed and bleed that a platelet count was preformed reporting a count of 8 then an hour later 7. I remember not understanding what was wrong with my little girl, only that she needed a platelet transfusion to survive. The days and weeks merged, my little girl was transferred to Brisbane and back to Lismore again the platelets went up and down like a yo yo. Every blood test was heart wrenching to witness personified by each little cry. Slowly after several weeks of transfusions her platelet count rose within normal limits. I am so grateful she survived as many babies do not survive this destructive disorder. I can't help reflect on the odds that saved her. The fact is my blood pressure was up a little and a blood test revealed my liver was "transplant material" as described by the doctor. I was admitted to hospital, labour was induced and my baby was out within 2 hours. How co-incidental was a tongue tie all these factors saved her life. My little girl turns 8 this year but she didn't escape from NAIT unscathed. Laura was left with a porencephalic cyst where the haemorrhage dissolved most of her left posterior lobe. The bleed affected the whole left hemisphere of her brain leaving her with a diagnosis of Porencephaly. Laura was diagnosed with a vision disability, learning difficulties and an epilepsy disorder. Considering the extent of her haemorrhage I am very grateful that she is here with us today. She can walk and talk, she loves drawing, posting and receiving mail and is even starting to read, something I never dreamed possible. She is truely amazing and I am so proud of each milestone she achieves. She has taught me a lot about parenting and the challenges in life for anyone with a disability or special needs. After losing a pregnancy in 2006 unrelated to NAIT, we explored the possibility of having another baby but nothing could have prepared me for the emotional roller coaster. Each morning while pregnant I just waited for the baby to move so I knew they were alive and the relief of an ultrasound showing no haemorrhaging only lasted the walk to the car park. It became obvious how risky my pregnancy was when my local hospital had concerns about me even entering it. My treatment included 84 grams of Intragam IVIg once a week. The infusion took around 7 hours during this time I became very close friends to the nurses treating me. When Wilson was delivered we questioned the effectiveness of the IVIg as he had a low count of 26 but we were extremely relieved when he responded well to a platelet transfusion sadly concluding that the IVIg had worked but only just. Luckily for Wilson there was no evidence of an intra-cranial heamorrhage and he is a healthy, happy and active 4 year old. After all the anxiety we decided our baby making factory was closed for good but fate had other plans and 3 years later we were expecting again. My pregnancy with Chloe was definitely NOT bliss, instead of enjoying each little kick, i was reminded that my womb was a ticking time bomb. I vowed I would never get pregnant again, the reality of losing a baby or having another child with a disabilty was just too real. Having access to an online NAIT support group provided the emotional support and strength I needed to get through each day. Learning about the disorder helped relieve anxiety and developed confidence in the treatment and care I was receiving. After seeing a fetal maternal specialist in Brisbane it had occurred to me that I was more informed and up-to-date with the disorder than what they were. Knowing my unborn child was at risk in their care I contacted a NAIT specialist in New York, USA who incidentally wrote the journals our Australian doctors were referring too and organised an appropriate treatment plan. The original neonatologist I saw told me he would only transfuse if platelets were below 10 and after discussion said okay 20. Despite me explaining to him that the hospital actually has a transfusion protocol and a premature baby with a known thrombrocytic disorder should be transfused if counts were below 50. I gave him a week to contact me regarding protocols and discuss another option plan and never heard back. The issue with NAIT is the antibodies attack platelets and renders their ability to aggregate. Any baby affected by NAIT can hemorrhage with counts of less than 50 our support group confirms this. I outsourced an informed paediatric hematologist and changed fetal maternal specialist at another major hospital ensuring my little girl was under consultation by one of the most informed specialist in our country and the other, in the world. A detailed neonatal treatment plan was devised including emergency c-section at my local hospital, if required. It provided a strong sense of security knowing there was an action plan for a specific scenario and everyone who had involvement with my pregnancy was aware what the procedures were. Ultimately I am forever grateful for this particular pediatric hematologist and my local haematologist who had a common sense approach to my treatment, without his involvement my initial treatment would not have occurred. With Chloe I was transfused with 168grams of Intragam (IVIg) twice a week taking approximately 14 hours to infuse. The longest day was spent on a ward and took 12 1/2 hours on a public holiday, that was a long day. My nurses referred to Intragam as "liquid gold". Mainly because it's in high demand and it's very expensive but ironically Intragam forms bead like bubbles on the surface that shimmer like a golden rainbow as it diffracts, its fascinating to observe. It's hard to imagine that 1.4 litres of Intragam passed into my veins each week. I recall one day waiting for it to be escorted to the hospital after being flown in from sydney and a couple of times when every other patient's Intragram in the whole hospital was collected and only just having enough for my transfusion. The last transfusion was certainly memorable as well when the big city nurse dialed up my intragam to be administered at a full rate of 200ml per hour. I refused to let her transfuse me cause I knew that i could have died or had a severe reaction. Most nurses know blood products are to be given in small concentrations and increments and built up to a higher rate over a certain amount of time according to proper protocol depending on batch numbers etc. It was awful as the nurse insisted she was correct. I rang my nurses back home in good old Lismore and they shared my concerns. It was very awkward I showed her the CSL manufactures recommendations that come with the Intragam, it was a drama but in the end I received the transfusion as per protocol and was thanked by one of the directors for bringing it to his attention and possibly saving many other peoples lives. Around 30 weeks, I was prescribed 50mg of prednisone a day to suppress my immune system. I decided against fetal sampling as intrauterine transfusion can cause heart bradycardia and fetal distress resulting in premature labour and/or death. Fetal sampling also compromises the effectiveness of the Intragram and because my immune system responded with Wilson I didn't want it to counter act my treatment with Chloe. Chloe was born alive, crying, pink with no bruises and an astounding platelet count of 109 a huge increment compared to her siblings with counts of 26 and 7. Her platelets continued to rise without any intervention and she is in the all clear. Her birth came as such a relief, the battle was finally over. I still cried even through her platelets were fine, I cried share relief. Chloe has just celebrated her second birthday, bearing no signs of her complicated pregnancy. She is adorable and certainly keeps us and her daycare busy. She is very bossy and is already singing the alphabet and can count most numbers to 18. She is amazing! When Laura was diagnosed with Nait it was suggested that my eldest son Jake may have been affected as well. After considering Jake's history of being resuscitated after suffering a fit at age 3 while in daycare and our pediatrician noting a right side weakness an MRI was performed. Thankfully no hemorrhage was evident but incidentally discovered that he actually has another type of cyst unrelated to NAIT. To date Jake now 13 shows no signs of a right sided weakness corrected i believe through a series of swimming lessons in his younger years. It will never be confirmed if Jake did have a small resolved bleed as his symptoms may suggest but what is important is how he is going now. Jake is an absolute delight of a kid, he's bright, caring, mature and doing very well in his 3rd year of high school. For us having another baby would truely be a miracle as I insisted the obstetrician zip me up like a fortress. Having 4 children are plenty for us and the fact that we didn't expect to have any more children after Laura, has come at such a blessing. The treatment can be very draining on the body but definitely worth the risks. I had no problems with the Intragam transfusions and am not sure if my complaints these days are related to the steroids or not. Not knowing the baby's platelet levels while in utero makes this disorder more emotionally challenging than other alloimmunization disorders making the quest for research all this more important. A year ago I met a mum whose baby had low platelets resulting in a small inter-cranial haemorrhage, according to her no explanation was given and neither parent was tested for NAIT. This worries me as I believe all babies who suffer low platelets or haemorrhaging should be investigated for NAIT unless there is strong evidence suggesting otherwise. I'm hoping our story provides support and hope to other parents dealing with this disorder that it is possible to have a healthy baby when a previous baby hemorrhages and in my case in fact another 2. But the reality is NAIT is very complicated, there are many variables and inconsistencies. It's difficult to find collations with antibody levels or in subsequent pregnancies let alone other parents cases to be able depict how each individual outcome will be. Ultimately my biggest thanks goes to the NAIT specialist particularly those on the Australian NAIT register. Not only are they informed about NAIT but they are interested in learning more about the disorder. Our goal to raise awareness and work towards a NAIT pre-testing system will be dependent on the qualified skilled professionals researching it. Finally, I would like to thank everyone who donates blood, my children would not be here today without you. I can never donate blood and because of NAIT I am a transfusion risk to myself. My friends will confirm that instead of accepting physical gifts for my birthday I suggest they donate blood. I think it is very important that if you are fit, healthy, able and capable, donate to the Australian Red Blood Bank. It is an opportunity to have regular checks on your own health and know that people's lives are saved because of it. Nait at the Minyon Falls lookout.